Neal Applebaum’s home runs on solar energy. The photovoltaic panel on a nearby hill generally supplies more power than he uses in a day and the electric company pays him for the excess. Some solar systems store energy locally in some kind of battery, but Mr. Applebaum’s is “grid connected” -- instead of storing energy he uses the existing grid as a sort of giant battery. His system is impressive and efficient, but Applebaum thinks there are much easier and more effective ways to cut energy costs. “We don’t really think everyone ought to go out and buy a solar system right now,” he explains, “it just isn’t the most effective way to cut costs.” His top priority is reducing energy use, and here are some of his suggestions. First, installing modern light bulbs is an investment that will pay for itself very quickly. Compact fluorescent bulbs will save 2/3 of the energy used by an equivalent incandescent. CFLs are widely available. Light emitting diode (LED) bulbs are fast becoming cheaper and better as manufacturers and researchers work to improve them. An LED bulb saves 1/2 the energy that would be used by a CFL, however they are still quite expensive compared to CFLs and incancesdents. “Just replace your 5 most used bulbs with CFLs,” Applebaum says. “That will make a huge difference”. While they have a slightly higher initial cost, modern light bulbs last much, much longer than incancesdents. Ceiling fans make roughly a 10 degree difference in both summer and winter. A quality fan can be purchased for $100 and installation is not too difficult (follow instructions or bring an experienced friend). Be sure to get a model with a spin reverse switch, usually you want counter clockwise in summer and clockwise in winter but check your model’s instructions. Check your windows and doors, especially in an older house. Properly applied caulk and weather stripping are essential for keeping conditioned air where you want it. New programmable thermostats are available for $50 or less that can really cut costs. “Spend some money to make sure your furnace is operating efficiently,” Neal Applebaum advises. Have a professional or experienced friend look at your furnace. Replace any old or clogged filters. If your furnace is having to work against a clogged filter, you are burning money. Many electronic devices draw power even when they are “off.” Cell phone chargers are notorious for this, but as general rule if a device is warm it is using power. Neal says “plug these devices into a power strip and turn it off when they aren’t being used.” He also says that some newer strips can detect when these devices are leeching energy and can automatically cut them off. Other solutions are remarkably simple. A laundry line, for example. “It worked for your grandparents, it will work for you,” Applebaum says. The best idea is to begin to think about your energy usage. Changing a few habits can make an enormous difference on your energy costs. These simple, cheap, and effective measures will drastically reduce your energy costs if properly executed. If you do decide in the future to install a solar or other renewable generation system, you will certainly want to have already implemented many of these measures to keep that meter ticking backwards. Until then, you can cut cost and reduce waste the old fashioned way. The Generation Partners program offers incentives for green power generation and negotiates the rates paid for green energy by utility companies. 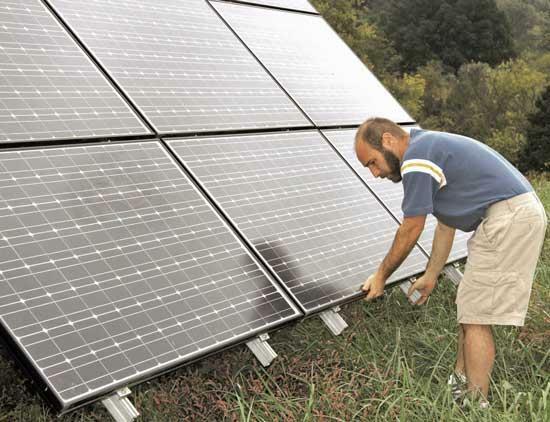 You can find out more about running a solar system in Tennessee from TVA’s Generation Partners FAQ at http://www.tva.gov/greenpowerswitch/partners/faq.htm.